One stamp I have been trying to get over here but looks like I need to go over the ocean to get it. Great card Bunny. This is so cute! Thanks so much for playing Simon Says Stamp Wednesday “Anything Goes” Challenge! Beautiful colors and design. Well done! Ach wie süß. Eine sehr schöne Karte. Love your summertime card! What says summer better than a cold popsicle! The colors are awesome too. 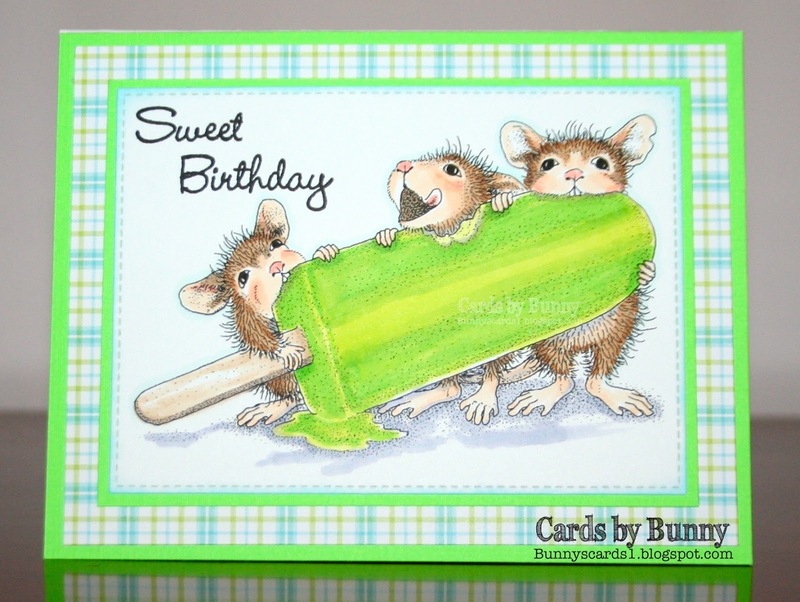 Glad you are playing along with us at the House Mouse and Friends Monday Challenge and sharing your card with us. This is a re-release of an older stamp, love that they are doing that, missed a few when they came out!! Such a cute card Bunny, great colours. Totally stunning Bunny - I adore the colours and design of your card. Such a lovely image and perfectly coloured as well! Oh, how cute! Adorable image & beautifully colored! Thanks for joining our weekly challenge at QKR Stampede! Oh these mice are just so cute! I love the bright green color of the popsicle! Have a lovely day! Take care. Super cute image ♥ I love the colors! Thanks for sharing your work with us at the Sweet Stampers Challenge. This is so cute! I love the green of the popsicle, it really makes me want to have one of those. Thank you so much for sharing with us at the Simon Says Stamp Monday Challenge Blog! So beautiful Bunny, great colouring too! Thank you for joining us at Crafty Sentiments and good luck! Awww what fun these guys are having cooling off in the summer heat..lol lovely vibrant colours super take on the chall theme Bunny. Beautiful colouring of this 'cool' image, love your card, Bunny. Thanks for entering into our 'Summertime'challenge at House Mouse & Friends, please join us again. Oh boy I love lime popsickles! Such wonderful vivid colors too! Bunny, can you please contact Christine, she is trying to reach you. Thanks.